Here is a bike that combines a few tricks to create a pretty good overall look. Like the headlight under the triple clamp, this gives the top of the bars a really clean swooped back look. The speedometer in under your right leg if you were sitting on the bike. This also adds simple design queues to the tall and pulled back bars. 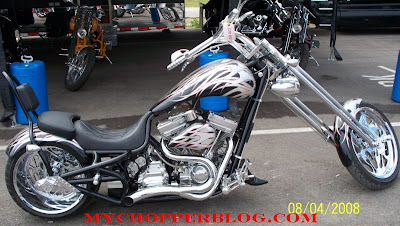 This keeps the front of the bike lower even though it is a bike with a tall chopper style frame. The pulled back bars also match well with the springer front end. The size and design of the tank add a good look to the space between the top of the big engine and the bottom of the tank. I like the idea of flames on the fenders and gas tank but I am not a big fan of these flames, they are too much for me, I think I would like them to be less pronounced or maybe just less all together, that is not to say someone else can't love them. The rear frame and seat pan are wild on this bike. The external frame around the rear end and the rear fender makes this look like it might have a hidden Softail shock, but I don't think so, it's clean looking yet a bit funky looking. The seat is definitely low and wide so with the bars up in the air like they are I might have a hard time see over the top. Maybe this bike is built for a guy who is 6 foot 4 inches tall. To give the builder credit this is another bike that was displayed by a vendor at the Broken Spoke Saloon at the north end of town in Sturgis South Dakota. This is the new Saloon out on Bear Butte road. I did not take any notes, so I don't relaly know who built it, I just took pictures of the bikes. I can see a price tag of $39,900 for this bike. Wow 40 grand for a bike, that is way too much for my blood, especially with the broken economy and failing banks and everything else that is happening this year. If and when I build a bike I expect to get a bike that looks something like this one but end up with a price tag of about $20,000 - $25,000. This is if I do all the work and paint myself. We will see, and I am sorry to say it might be ten years before that happens. I guess I will keep researching and dreaming about it. You gotta have a Dream, "What's your Dream, everyone who comes to HollyWood has a dream!"